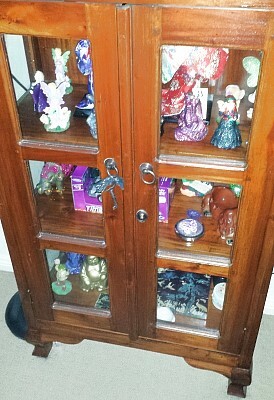 Let us take a closer look at the second glass cabinet of keepsakes. The top shelf is quite full so I’m breaking it down into two parts. Lots to see here – various ceramic figures two of which I made myself right next to each other on the right hand side, the silver haired lady in the purple glitter gown, and the red haired lady in the green glitter outfit. Multiple fairies of various versions. Plus a Halloween snow globe which I believe Sephy sent to me. 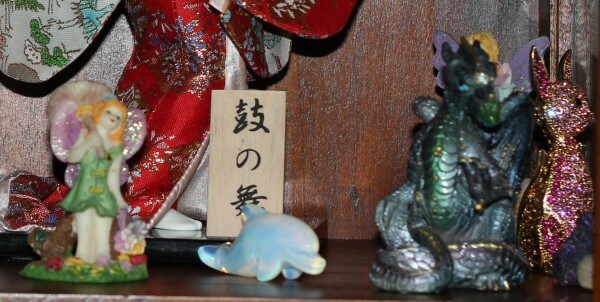 Here we have another Fairy friend, a moonstone Dolphin which I got in Hawaii, another dragon, and a pink sparkly cat which came from a Korean friend of mine.. There is also another Fairy friend hiding at the back there. This large doll I found somewhere in a shop. 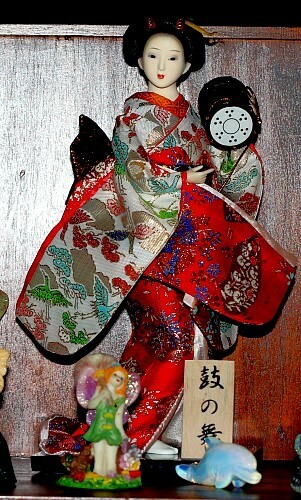 My parents had a bunch of these dolls which came from Japan and I am trying to start my own collection. The middle shelf – a couple of glass tealight holders at the very ends of the shelf – an elephant sits next to my very own DeLorean time machine. On the other side is a garden gnome I made myself. In the middle is a somewhat battered but extremely special to me keepsake – a ceramic dog ashtray that belonged to my Grandfather. 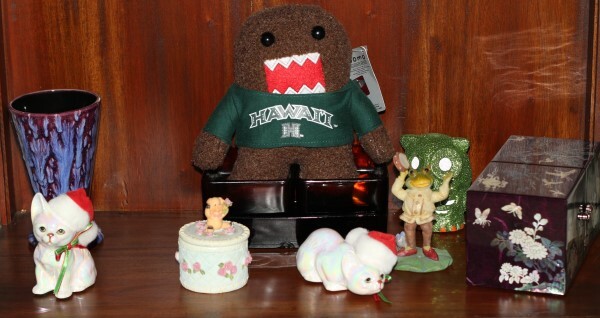 The bottom shelf – my Hawaii Domo sits in some glass desk units which belonged to The Other Half’s Mother. The two ceramic cats are from Sephyroth – the ones which were hidden in my new shoes! – a ceramic keepsake holder which has some glitter inside and a special mother of pearl jewellery case. 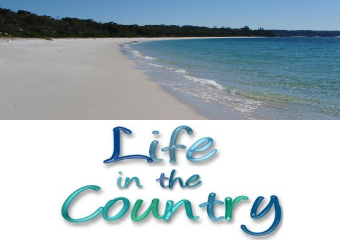 In future Wednesdays here on the blog, I intend to take a closer look at some of the keepsakes on Wednesdays. You’re so talented making those figurines yourself! 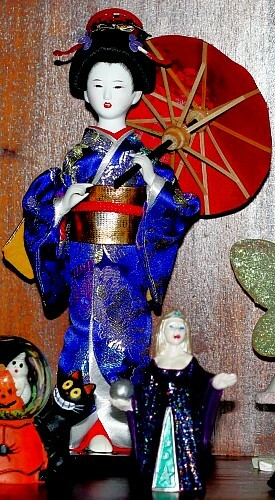 I love the geisha girls and the halloween snow dome. Especially when you consider I am “no good at art” according to my year 9 teacher. :) I think they came out incredibly well! I loved doing ceramics, it was most awesome. 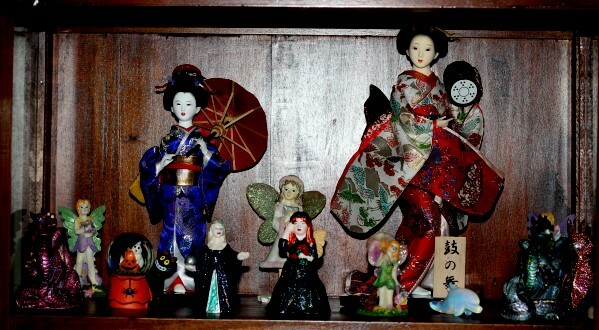 Love the dolls and your figurines. You have a great eye, which I do not. I love posts like these. I did a similar thing a year or two ago. Those figures you made are really cool.